The constellation Corvus. Roll mouse over to see labels. 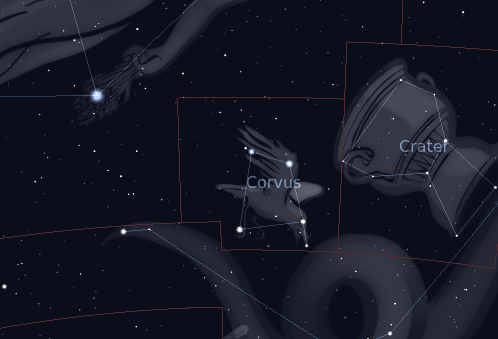 Corvus is a small constellation in the southern sky, nestling to the south of Virgo. 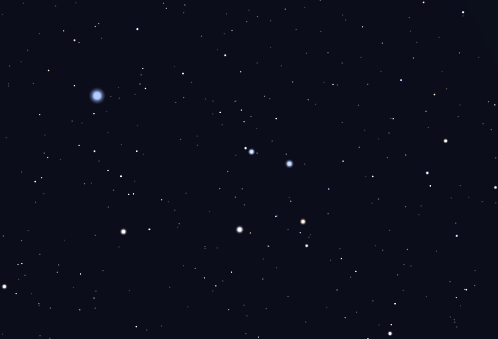 Visually, it appears as a trapezoid of second and third magnitude stars not far from Spica, which appears highest in the evening sky in the months around March. Most of the objects of interest in Corvus are faint. It is home to the merging galaxies NGC 4038 and NGC 4039, collectively known as Arp 244 or the Antennae galaxies. Near the center of the trapezoid lies the tenth-magnitude planetary nebula NGC 4361, sometimes known as the cosmic water sprinkler. The name ‘Corvus’ is Latin for ‘crow’, the sacred bird of Apollo. The crow is often identified as the bird sent by Apollo with a cup to search for water. The bird became distracted by a fig tree, and delayed returning to Apollo. The bird returned and lied that a water snake had preventing it from filling the cup, and returned with the snake in its tallons. Apollo saw through the ruse, and cast all three into the sky as Corvus (the crow), Crater (the cup) and Hydra (the water snake). Corvus contains the following Caldwell objects: C60, C61. The following constellations neighbor Corvus: Crater, Hydra, Virgo.